Friday marks the last day of work for Apple's longtime PR chief Katie Cotton. After spending 18 years in Cupertino, much of it as a handler for late cofounder Steve Jobs, the company's vice president of worldwide corporate communications will step down to spend more time with her family. 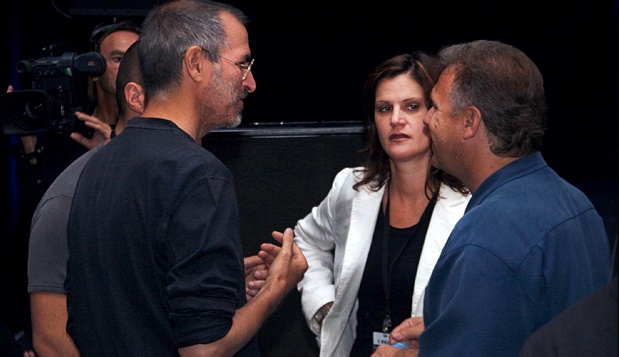 Katie Cotton speaks with Steve Jobs, Phil Schiller and Jony Ive. Photo via Inc.. In an essay covering Cotton's career at Apple, Re/code's Kara Swisher revealed that the PR guru will be heading for the door after the workday is over. Cotton's retirement was announced earlier in May, though at the time a definitive exit date had not been set. Cotton was a polarizing figure for the media due to her aggressive protection of Apple and tight control over what information. Some had taken to calling her derogatory names, though Swisher notes PR heads at most other big-name tech firms are cut from the same cloth. As one of the most powerful executives at Apple, Cotton kept somewhat of a low profile. Her behind-the-scenes influence was unquestionable, however, as seen by her handling of Jobs' long-term illness and other controversies like the stock backdating scandal. Her operating style of being tight-lipped and selective in what statements were issued proved impressively effective, with journalists clamoring to get any scrap of information from Apple as other companies pushed regular press releases. Cotton created a demand for Apple news and tantalized reporters with very little supply. Apple spokesman Steve Dowling, who announced Cotton's departure, is thought to be in the running to replace the PR chief. Another candidate is Natalie Kerris. Both Dowling and Kerris have been with Apple for over ten years. Cotton said the decision to leave was "hard," saying Apple was "a part of (her) heart," but in the end she chose to spend more time with her children.